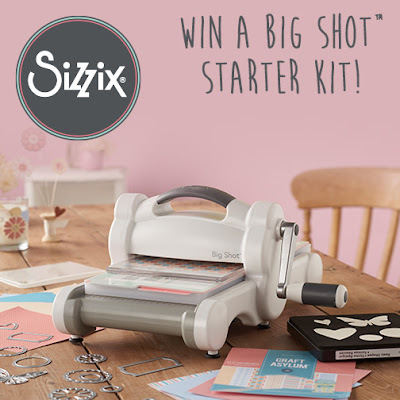 The new Big Shot Starter Kit has been released, now you have the chance to WIN one of your very own on the Sizzix website! This kit is perfect for all experienced makers and those starting out in the creative world as it suits all abilities and has an abundance of project possibilities! I love it but then I am biased as I designed the dies and embossing folder! The Big Shot is allows you to use the Bigz steel blade dies which cut a variety of materials from paper, card, fabric, felt, cork (just to name a few) and the Starter kit comes with a selection of Dies, Embossing folder and a 5.5” x 6” paper! Click here or on the photos for the link. Closing date: Friday 6th November 2015 at 10am GMT. Good luck! i would love to win something like this.I have been looking at them.It would be wonderful to win something like that. Thanks for the chance to try to win it.